Image 1 of 17: Your seaside vacation rental. 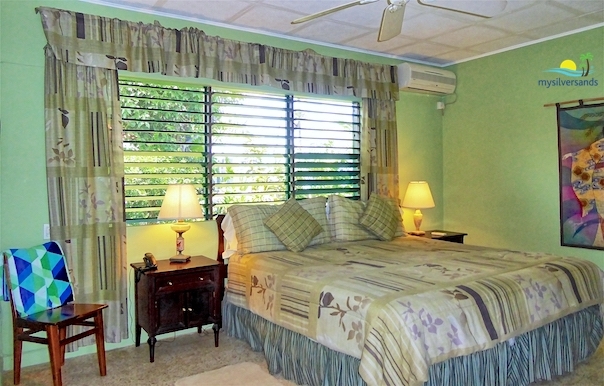 2 of 17: Jamahome is situated on the seafront at Silver Sands Jamaica with an unobstructed view of the Caribbean Sea. 3 of 17: The verandah is completely screened - lounge here and enjoy that incredible view of the Caribbean Sea. 4 of 17: Family Style Dining with a sea view. 5 of 17: Relax in the comfortably furnished living room where the sea breeze blows through from the wide doorway which leads to the screened verandah. 6 of 17: The West Bedroom is furnished with a king-size bed. 7 of 17: The Southwest Bedroom is furnished with twin beds. 8 of 17: The South Bedroom is furnished with a queen-size bed. 9 of 17: The Southeast bedroom is furnished with twin beds. 10 of 17: The East Bedroom is furnished with twin beds. 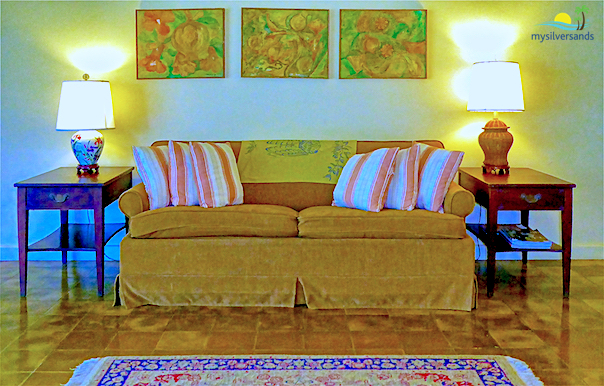 12 of 17: Comfortable sofa in the Living Room. 13 of 17: Enjoy the sea breeze and sea view from the screened Verandah. 14 of 17: Nothing but lawn of beautiful trees between Jamahome and the Caribbean Sea. 15 of 17: Looking to the Northwest. 16 of 17: Looking to the North. 17 of 17: Looking to the Northeast. 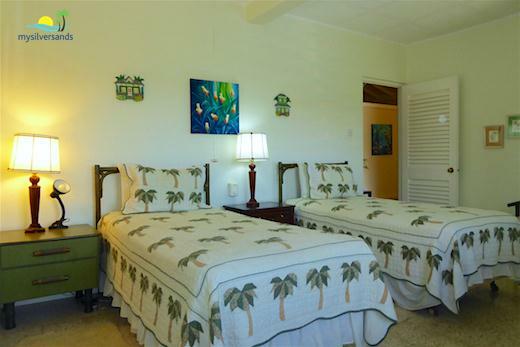 Jamahome is a five bedroom villa (rental as 2, 3, 4, or all 5 bedrooms) sitting about one hundred feet from the Caribbean Sea at Silver Sands Jamaica. 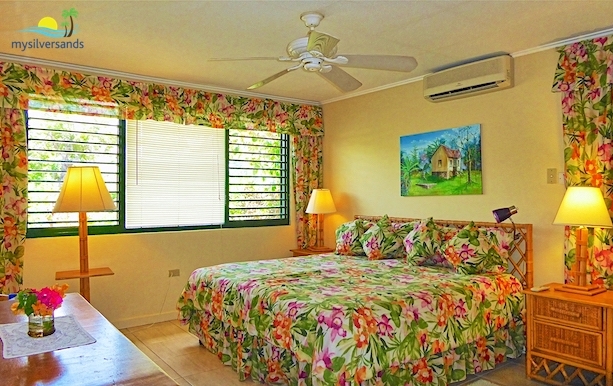 Jamahome is a traditional private vacation rental with a cook who will prepare all your meals and a housekeeper who cleans and makes the rooms every day. Located on the Caribbean Sea, the views are spectacular and the swimming beach is less than five minutes walk along quiet private roads within the gated community of Silver Sands Jamaica. 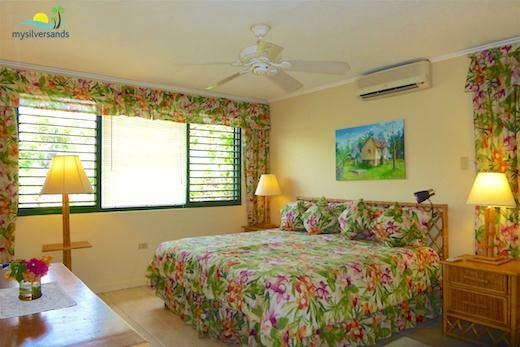 Five air-conditioned bedrooms, each with a private bathroom, of which three are en suite. 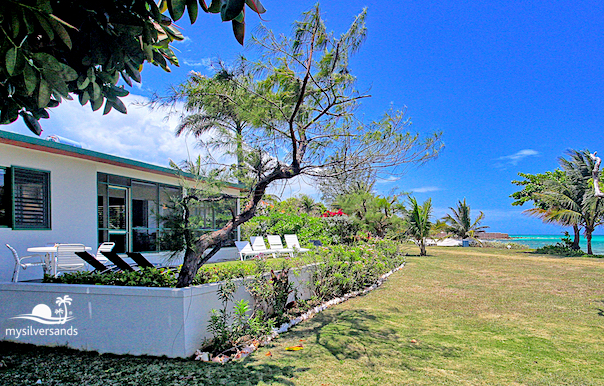 Spacious seaside patio with nothing but a grassy field and trees between Jamahome and the Caribbean Sea. 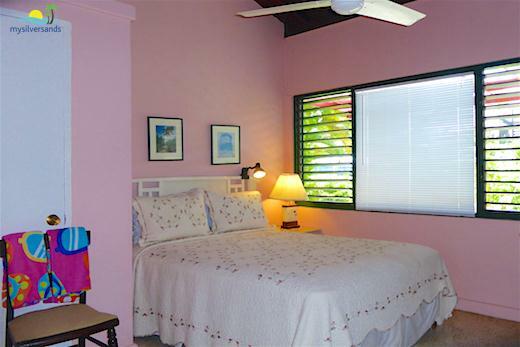 Large screened verandah with an unobstructed view of the coast and the Caribbean Sea. Flowing into the verandah, the living room is roomy with comfortable furniture and cross-ventilation; nevertheless there are two ceiling fans and a pedestal fan. Separate dining room with long table to seat ten persons comfortably for family-style meals. There is a large television with cable service in the living room, and a telephone. Equipped with a DVD player and a CD player. Child-friendly house with crib, high chair and baby bath provided. Surrounded by lovely tropical garden. A path leads from Palm Grove Road to the seaside along the Eastern side of the property and adjacent the path is an open undeveloped field. Free WIFI in every room with the strongest signal in the living, dining and verandah areas. Fully-equipped, spacious kitchen with food-preparation island. Outdoor barbecue grill. In case of an electricity service failure, a generator, with manual switch-over, powers the living and dining room areas and kitchen. House staff work an 8-hour day from 8:30 am to 4:30 pm. A cook and at least one housekeeper (depends on the number of persons in your party) work every day during your stay. Depending on your choices, breakfast is served by 9:00 to 9:30 am. The staff prepare dinner and depart at 4:30 pm, leaving hot dishes in the oven warmer and cold dishes in the refrigerator for guests to help themselves at their convenience. Maximum number of guests is 14 persons, inclusive of 2 infants/toddlers. 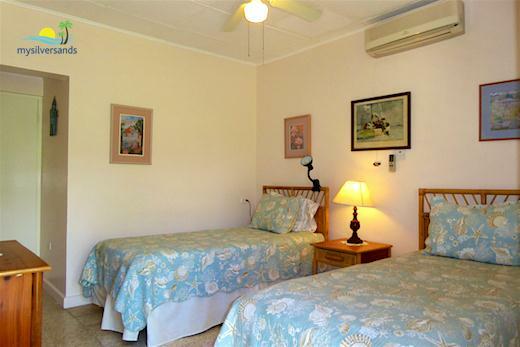 There is a surcharge of US$25 per person per night for more 1 or 2 persons 12 years old and over. 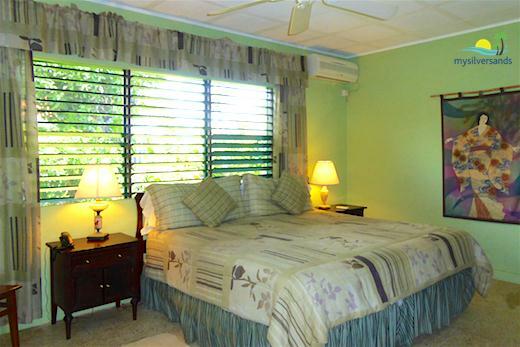 Jamahome Villa costs from $350.00 to $500.00 per night.